Incredible offering. 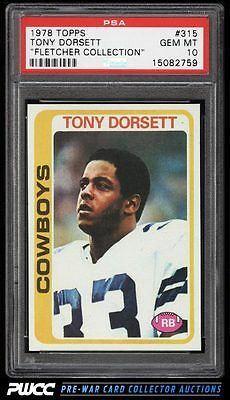 Along with the Bradshaw, Staubach, and Payton RCs, the '78 Dorsett RC ranks as one of the key rookie cards from the 1970s. Due to the high volume of 70s cards, the GEM MINT grade has become the condition of choice by elite collectors. However, due to the poor paper stock and printing techniques of yesteryear, very few cards ever received the production quality worthy of an ultra high grade. The offered specimen not only hit every mark during production, but miraculously survived an additional 35 years without any signs of circulation. Just the 12th example to survive the harsh PSA grading floor and emerge with a GEM MINT designation. On the auction block is the current #1 Finest Heisman Trophy winner collection. An all togerther impressive offering which includes many difficult cards within. One of nearly 17,000 cards, lots, and sets up for bid in our 8th Auction of 2016. Click on the link above to view the other PWCC auction lots.